Silver needles flicking up and down, logs popping in the wood stove, talk and laughter, soup pots clanking in the kitchen, the murmur of elders to youth around the quilting frame. Singing. 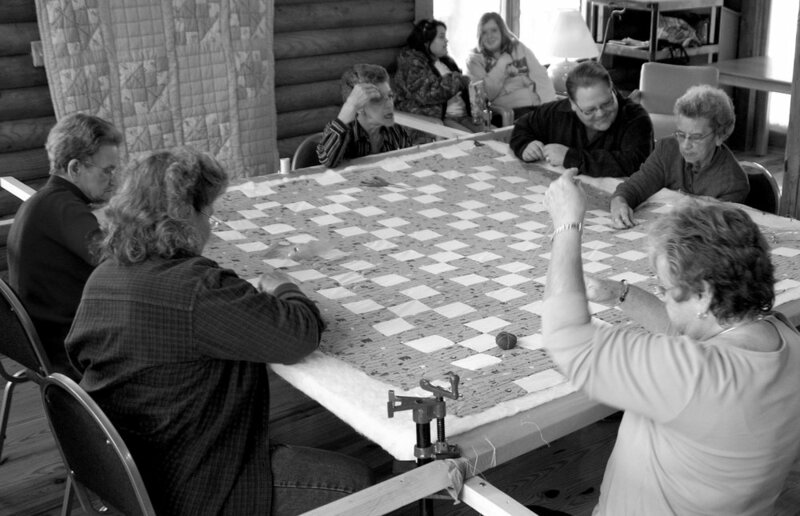 This is a contemporary quilting party at the Sappony Tribal Center. Our elders teach our youth to quilt, to sew. Those who know how show others how to bead, to make ribbon skirts, to document ourselves. Those who have brought food, stew for a cold January day, prepare and share. Our own stew, from our annual tribal fall stew event. Those who are in need of community, of strength from each other, come. We have always depended on each other. For strength, emotional and literally physical. For comfort, for healing. We are only as strong as the weakest among us. We have always lifted each other up. In 1714, we were at Fort Christanna in Virginia. Even then, our people traded in much of our deerskin-wear for the broadcloth and blue and red wool of the colonists to make leggings, skirts, blankets and matchcoats. Our young men wrapped themselves fiercely in blue and red stroud cloth as they met with colonists at the fort. Over 200 years later, during the Depression, we were in High Plains. Our handmade quilts kept us warm on feather- or straw-tick during cold nights. And in years after that, in the 1940s and 50s, we still made beautiful, warm patchwork quilts out of old clothes, flour and feed sacks, any fabric we could find, really. Necessity married with creativity, originality, and artistry; the children of that union were beautiful examples of comfort, security, and history. For the news write up of our 2019 Quilting Bee, please see 2019 Quilting Bee in our Community News section. 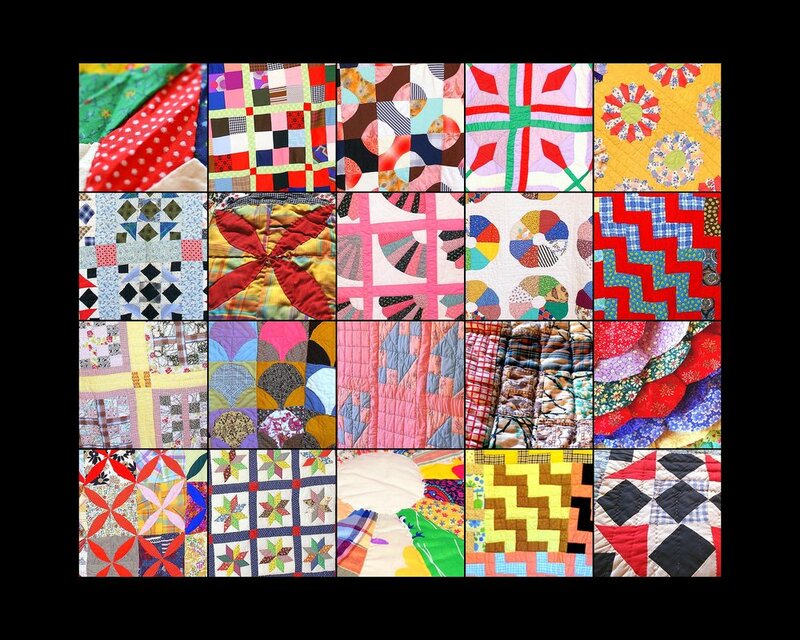 Listen as an elder softly runs her hands over the patchwork on a family quilt, reminiscing about the skirt she wore made from that flour sack, or the pajamas your great great grandmother made your great uncle from that feedsack piece. Listen and remember. by David Cecelski, Southern Oral History Program, UNC As published in the April 11, 1999, edition of the Raleigh News & Observer. I visited Lois Epps Jones in High Plains, an Indian community north of Roxboro, in Person County. Her great-grandfather found refuge in High Plains during the Cherokee Removal. Now she is one of the community elders seeking federal recognition for the High Plains Indians. Like so many rural women before and since, Jones had to leave a beloved community to gain her own freedom. 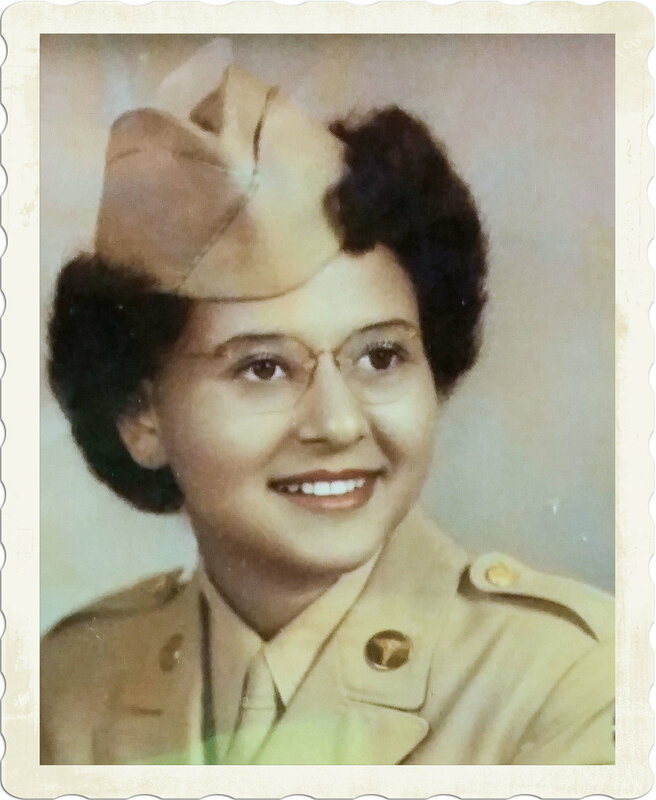 In 1941 she left High Plains to become an Army nurse. She would not return home for good for 35 years. It was the turning point in her life. The hardest part was saying goodbye to her father, a tobacco farmer named Alexander Epps. I used to love sitting outside when my dad was curing tobacco. We would sit out in the moonlight and roast apples and he'd tell me about the things that happened when he was growing up. Naturally, when we were working in the tobacco, we didn't have all the modern things. My dad never had a tractor; never had a chainsaw. We were what you called the dirt farmers. We had two little mules. Those old mules were so mean that they would practically eat you up alive. They would have you as ragged as a jaybird. We Indians lived separate and apart. We were set aside because of the color of our skin. We could not go out and eat a meal in public. We could not go in the restaurants because they only had white and colored. We weren't colored. We weren't white. We were neither. Blacks at least had a section at the theater - there was no place for us. If we needed to go to the bathroom, right up on the door: white, colored, but no Indian. And for me, as an Indian, to speak to you! Not on your life! We had our own church, our own school. We'd go to Roxboro maybe once a year if we were going in after a pair of shoes. We never had any use for the law. We weren't calling the police, and the police wasn't coming. Growing up at the farm, we didn't have time to get out into other things. We were too busy trying to make a living. Mom couldn't have taken care of 10 children if everybody didn't have a job. We didn't have running water. We had to carry water from the old spring. In the afternoons, if she was going to wash tomorrow, we would bring water up, store it in tubs and a barrel the day before. In the summer, when we were out of school, we would take all the clothes down to the branch and wash there. We'd dip our water out, make us a fire in the pot and heat our water. By the time you did all that, and take care of your cows, your horses, your pigs, your chickens, you didn't have a lot of time to think about entertainment. You were so glad to get finished with what you had to do! There were no weight problems then! There was nobody going to the gym and all that, because the gym was right there! All we were looking for was a place to lay down quietly. We didn't have to have a book accompany us to bed to drop off to sleep! We were brought up in church, believing in the way of life that the Bible taught. Never a day started that my parents didn't ask God's protection for us and them. It was instilled in us to know that as we lived, so would we die. You don't live alone, and you don't die alone. I was taught that how I live my life has an effect not only on me, but on the rest of my family. If you and your wife work in public, your child will never have the connection with you that we had with our parents, daddy being a farmer. We were taught things. We were around them. If I had a problem, I didn't go to my peers or call the school counselor. My counselor was my mom. I was born in the warmth of her bed. I remember back, as a very, very young child, standing between my dad's knees in front of the fireplace where it was warm, and my baby brother laying in my mom's lap. He used to pretend to cry in the evenings, and she would sit him down in her apron and pull off his little shoes and he would warm his feet by that fire. This bonding is what he wanted. I wouldn’t trade it for nothing! No child could have been happier. You see, I didn't realize how disadvantaged I was because I had so much of the things that are essential. I had love. I had security. I had encouragement. You never had to worry in High Plains, because we were all for one and one for all. Nobody had to fear each other. My sisters and I would get on the road and walk to Bethel Hill on a Saturday, to Virgilina, to Mayo. We'd walk miles and miles. And we had so much joy in our lives, that the tragedies became so much smaller. I would have preferred to stay, but I knew I couldn't. If I could have lived right here in Person County and taught school at Bethel Hill or Roxboro, that would have been different. But I couldn't, not as an Indian. I knew if I ever were to accomplish anything, I had to leave to do it. I was the first High Plains girl that ever went away from home, that wasn't married and moved with a husband. My parents knew how much I wanted something for myself, but others laughed at me. Yes, I was the laughing stock! The dreamer! "Your daddy doesn't even make his expenses," they'd say. "He can't ever finance you to do the things you're dreaming about." I didn't expect him to! But one day I was going to grow up. I was determined. I felt there had to be somewhere in this world I wasn't going to be treated any different because of who I was and where I came from. When they asked, "Who are your parents? Where do you come from?" there had to be somewhere that it didn't make any difference when I said, "I'm Zan Epps' daughter. I'm an Indian from Person County." I wasn't ashamed of being Zan Epps' daughter. I was proud. 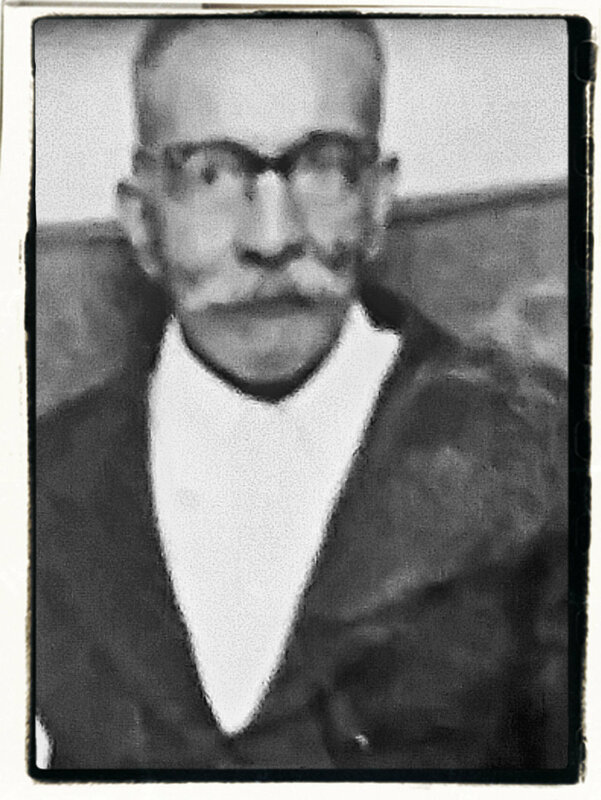 I had one of the greatest dads. Daddy didn't go to college. He couldn't read or write, but he was one of the wisest guys I've met. Education is from a book. Wisdom is from God. Any guy could take two little fuzzy mules and this land, raise 10 children and a sickly wife and never take a loaf of bread as a handout, to me he's not an ignorant guy. He was uneducated in a lot of things, but life didn't happen to be one of them. And let me tell you: If you could have seen that old man's face the first time when I came home from the Army! When I stepped off that train, oh, the look on his face! The pride, the joy. Words cannot express it. Somebody said to him, "Who are you looking for?" And my daddy raised his hand, proud as a peacock, and said, "That's my daughter."